The Fly of Despair – From SpongePedia, the biggest SpongeBob-wiki in the world! 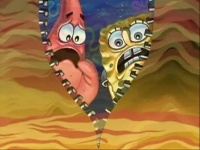 The Fly of Despair is a zipper that is only seen in Shanghaied when Squidward was thrown down here by the Flying Dutchman. The zipper is filled with ghostly laughs, monsters, a spaghetti-themed part and an exit into another place (which is the victim's house). The name is a pun because the victim flies in there and a fly is also a zipper. So far only Squidward has been thrown down. This page was last modified on 1 January 2019, at 01:13.